Chris Atwood throws a pitch versus the Lions. 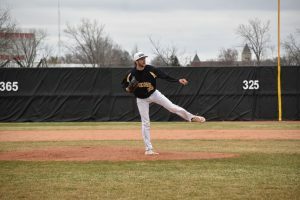 Atwood threw the tenth no hitter in UWO history and the first since 1995. He recorded 13 strikeouts on 88 pitches. 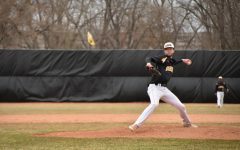 The UW Oshkosh baseball team won eight straight games beating Earlham College (Ind.) 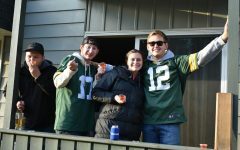 three times, Milwaukee School of Engineering once and Finlandia University (Mich.) four times. 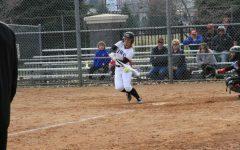 The Titans played two double headers at home on March 30 and 31 versus Finlandia University and won all four games. 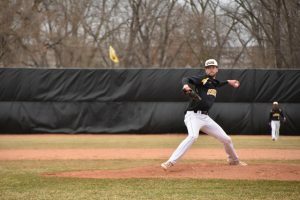 In the third game versus Finlandia, senior Chris Atwood threw the tenth no-hitter in UWO history and the first since 1995. Atwood finished with only 88 pitches striking out 13 batters walking none. Atwood said the prospect of completing a no-hitter was in the back of his mind as he entered the final inning. In the first game, Colan Treml pitched a shutout, giving up only one hit and recording 11 strikeouts. 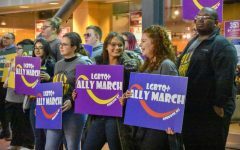 UWO mercy-ruled the Lions 10-0 in seven innings. Treml said winning starts at all facets of the game. In Saturday’s second double header, the Titans mercy-ruled the Lions again, this time 21-7 in seven innings. 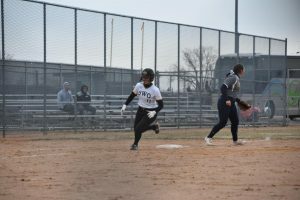 UWO scored 10 runs in the first inning, two runs in both the second and third innings and pulled ahead of the Lions 14-1. In the fifth inning, the Titans recorded five runs and scored two runs in the sixth. Leadoff batter Zack Radde recorded four hits and scored two runs while batting in two runs. Teammate Hunter Staniske also recorded four runs, four hits and four runs batted in. On Sunday, the Titans won both games versus the Lions. UWO defeated Finlandia 8-0 in the first game and 10-2 in the second game to complete the sweep and extend the Titans winning streak to nine games. Dylan Ott hits the ball versus Finlandia University. 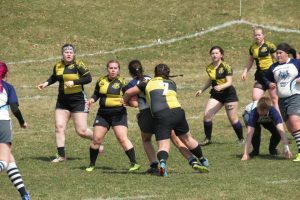 On March 26, UWO traveled to Kenosha to play Milwaukee College of Engineering, winning 14-9. The Titans scored five runs in top of the first inning led by Sean Cummins’ two-run homerun. In the bottom of the first inning, the Titans gave up six runs to fall behind Milwaukee School of Engineering 6-5. UWO only allowed three runs for the rest of the game while scoring in nine of their own. Cummins led the offensive charge with three hits, three runs and six runs batted in. 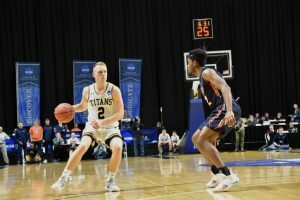 The Titans traveled to Earlham College in Indiana to play a three-game series on March 23-24. In the first of three games, Treml pitched 8.2 innings allowing zero runs and only four hits while striking out nine batters en route to a 8-0 victory over the Quakers. Offensively the Titans recorded nine hits as a team, leading to eight runs. Senior catcher Jensen Hinton batted in three runs on two hits. 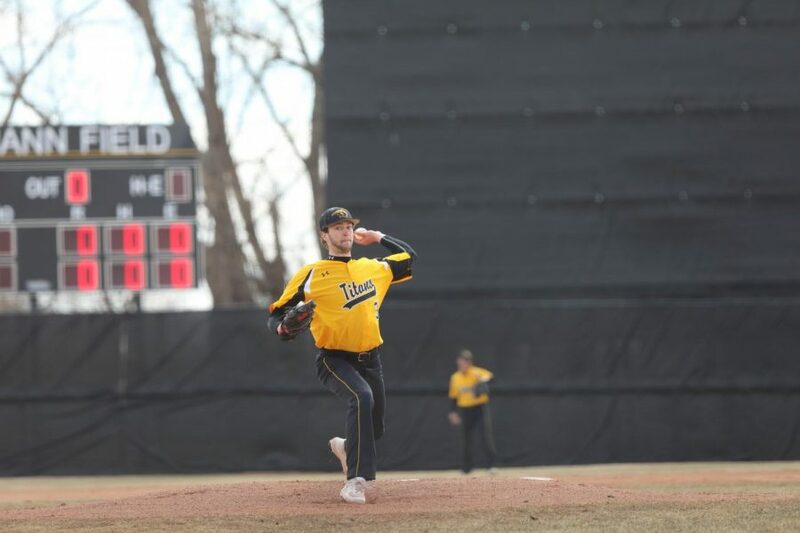 In the second game of the Saturday double header, UWO won 7-5, railing from a four-run deficit. After giving up four runs in the second inning, the Titans buckled down defensively, allowing one run for the remainder of the game. 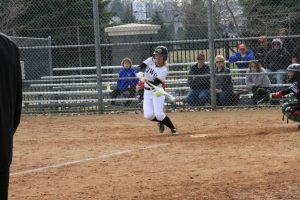 UWO scored three runs in the third inning, two in the fifth and one run in both the seventh and eighth innings. The team carried a balanced offensive performance with seven players recording a hit and scoring efficient seven runs on 10 total hits. On March 24 the Titans wrapped up their three-game set against the Quakers with a 6-5 win in 10 innings. UWO led 5-2 entering the bottom of the ninth inning. The Quakers forced extra innings bringing in three runs. 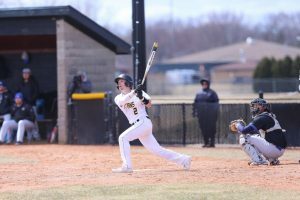 In the 10th inning, freshman catcher Kade Bohlman drove in the game-winning drive with two outs in the top of the inning to put away Earlham College, completing the sweep of the Quakers. The Titans outscored opponents 84-28 over the past eight games shutting out the opponent three times. Head coach Kevin Tomasiewicz said his team has come a long way from the beginning of the season. 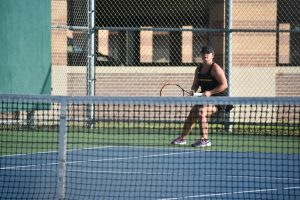 UWO will begin conference play when they travel to UW-Whitewater to play two double headers Saturday and Sunday. Game times are set for noon and 3 p.m. both days.